Over the years, many of our customers have expressed the concern that truly classically started horses are altogether too rare. We concentrate on producing correct young horses for sale. 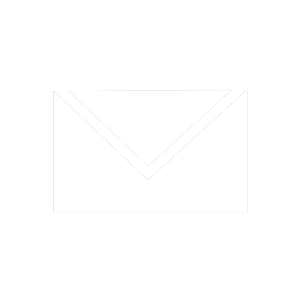 We offer several young horses throughout the year, and ask interested parties to check the website regularly, but also to email or call at any point. Some horses may not be ready for the website, but might be available shortly. In some cases, horses can be specifically prepared for buyers. All prospects are rigorously selected for disposition and trainability first, then for athletic potential. They have undergone a thorough medical exam, including x-rays. The education of these horses has not been relegated to novice riders or working students, nor hurriedly prepared for auction, but the opposite. They are carefully started by experienced FEI riders. Our aim is to produce a horse capable of providing a classical riding experience. 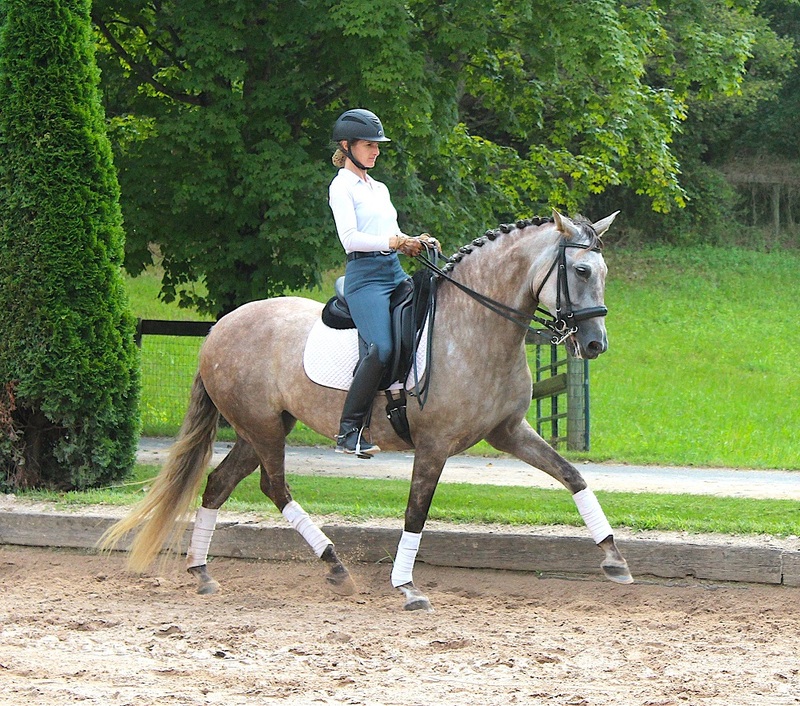 16.1, 7 year old gray PRE Andalusian mare, IALHA registered. This beautiful granddaughter of Spanish Olympic horse Evento, is very safe, has excellent movement, and comfortable gaits. 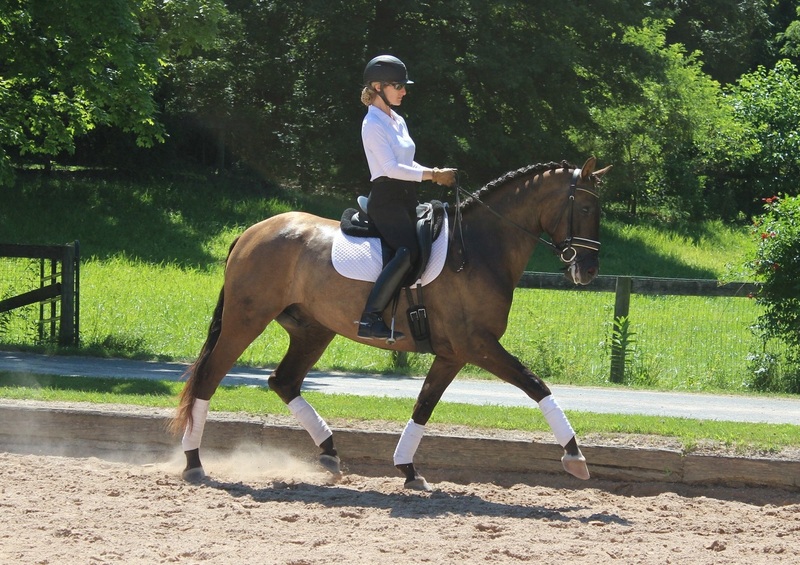 She has experience hacking out and going to shows, and is now in serious dressage training. Jacaranda has been thoroughly vetted and is sound; currently barefoot. A pleasant horse in the barn, she has great potential, is very smart, and will advance quickly. An exceptional prospect. Unusual Andalusian gelding, brown bay, 4 years old. 16.2 hands, by Grand Prix stallion Fiero LFA. 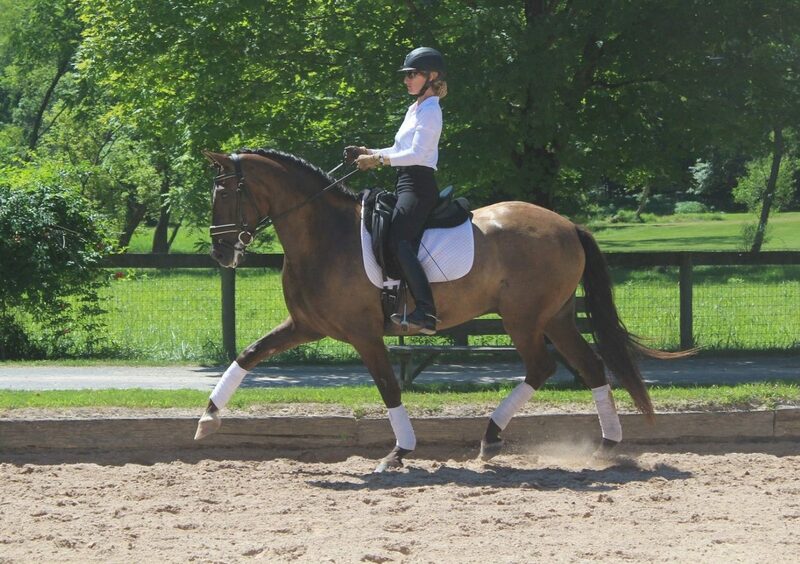 Truly exceptional prospect, excellent temperament, comfortable gaits. Everyone who has visited the farm and has seen him cannot take their eyes off him. Beautiful mover with a brain to match. Knows all lateral works, solid counter canter, started on changes. Very smart, great natural balance. Good manners, always sound and healthy, can live inside or out. IALHA registered. 3.5 year old Andalusian cross mare. Rich bay with white blaze. Should mature 16.0 +/-. Very nice disposition, excellent work ethic, comfortable gaits. Not spooky or tense, goes willingly forward. Will stand out as mover as she matures and gains strength, beautiful canter. Clean x-rays on file. At 16.3hh and 5 years old , Elsa is a stunning mare by Excelso out of Delirio, a purebred Andalusian imported from Spain. Elsa has a solid start to her serious training, but shows a great ability to collect and shows the beginnings of powerful, expressive extensions. 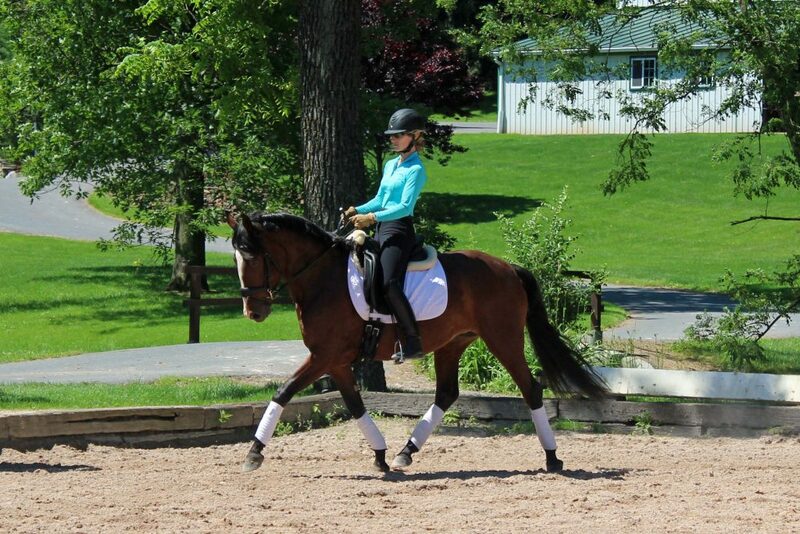 Elsa has never shied; she has a good work ethic and very comfortable gaits. Schooling lateral work and nearly confirmed in her flying changes, this is a self assured horse with the very highest potential. 3 year old 16.2hh Andalusian/Oldenburg gelding, by Grand Prix stallion Excelso, out of an Oldenburg mare that is so reliable she is currently one of our principle schoolhorses. Encanto is a top prospect, a leggy, big mover, with a great mind. No misbehavior, tries hard everyday in his work, and will mature to an impressive and elegant partner. Very personable and no-nonsense disposition. Coming 5 year old 16.1hh 7/8 Andalusian gelding. This young horse has an excellent working temperament, forward with a great mind, no shying or misbehavior. Light in the mildest of bits, uphill with wonderful balance. So secure and confident in his personality, he works with company or alone and pays attention to the rider even if other horses leave him. 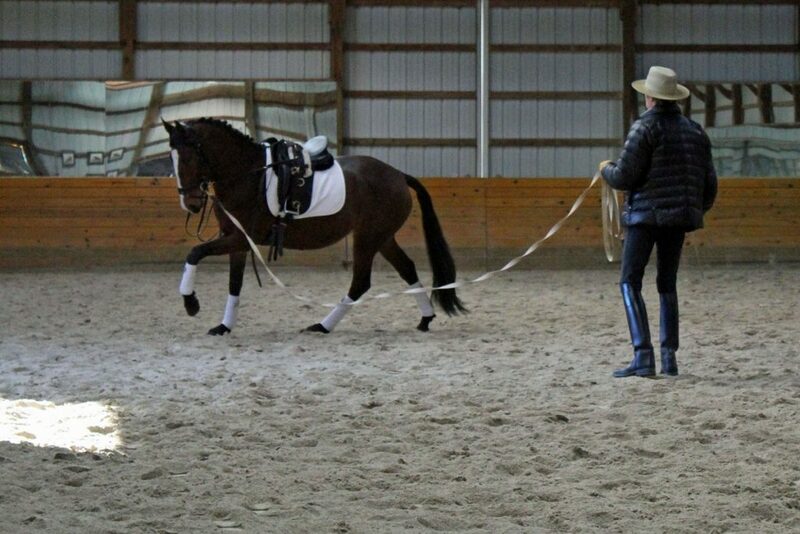 Started in lateral work, lengthenings and counter canter. A joy to train and be around. Full vetting with radiographs available. "Ecco" is a coming 4 year old purebred Andalusian gelding. 16.1h, should mature around 16.2h. Excellent conformation, great hindquarters, beautiful straight mover. This elegant horse will be stunning as he matures. He has an excellent working temperament, all the right tendencies, always pleasant and easy to live and work with. Started lateral work, lengthenings and counter canter. Works by himself or with other horses. Unlimited potential. 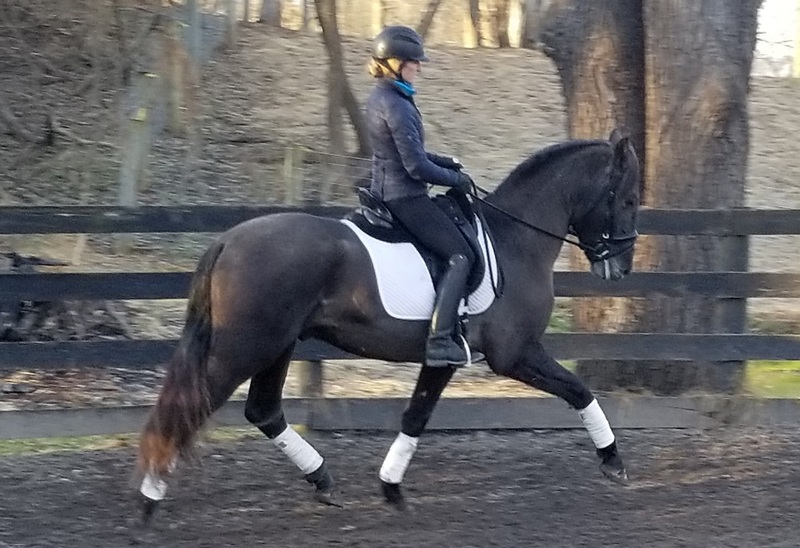 9 year old 16.2hh Andalusian/Hanoverian gelding by the Grand Prix stallion Donovan. Milano is solid Prix St. Georges/I-1, and is schooling one-tempis and half steps. Fun, playful personality, with a extensive show record through the levels. 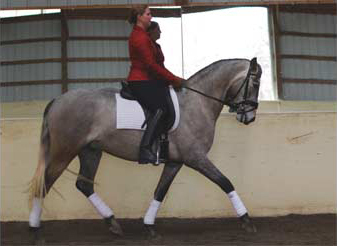 Comfortable gaits, powerful movement and great work ethic make Milano an ideal horse to take to the top levels. Absolutely sound and healthy with no maintenance. Exvoto is a 3 year old purebred Andalusian gelding by Excelso out of a PRE mare whose pedigree includes the legendary Leviton--sire of horses on the Spanish Olympic Team. This is an exciting horse. 'Woody' has a very responsive personality, loves praise and learns quickly. He has impressive yet elegant movement which will only become more beautiful as his strength develops. Comfortable gaits, very well balanced. Woody is currently just under 15.3hh and should mature 16hh+. Great potential for someone wanting a smaller horse with unlimited potential. Ascenso is one of several horses by Excelso out of a Hanoverian mare, a cross which has produced exceptional horses for us. Ascenso is currently 16.3hh and should mature just over 17hh. He is a very intelligent horse with big, powerful gaits yet he is light in the bridle and exceptionally well balanced and graceful. Unusually symmetrical and has a solid work ethic. He is really enjoyable to work around and live with. This horse could show in any company and yet makes daily practice by yourself a joy. Ascenso walk, trot, canters and has started shoulder in and counter-canter. Always sound, never misbehaves. With his easy and uncomplicated personality he is ideal for an amateur looking for a quiet, sane, yet talented prospect, or he is fancy enough for a professional to take to the highest levels. Espadin is a 3 year old purebred gelding, 16hh (should mature to 16.2hh), by Excelso out of Delirio, a mare imported from Spain. Espadin is a beautiful horse with natural engagement and a workmanlike disposition but yet has a willingness to go forward. Three excellent gaits; when he matures he will be very impressive. 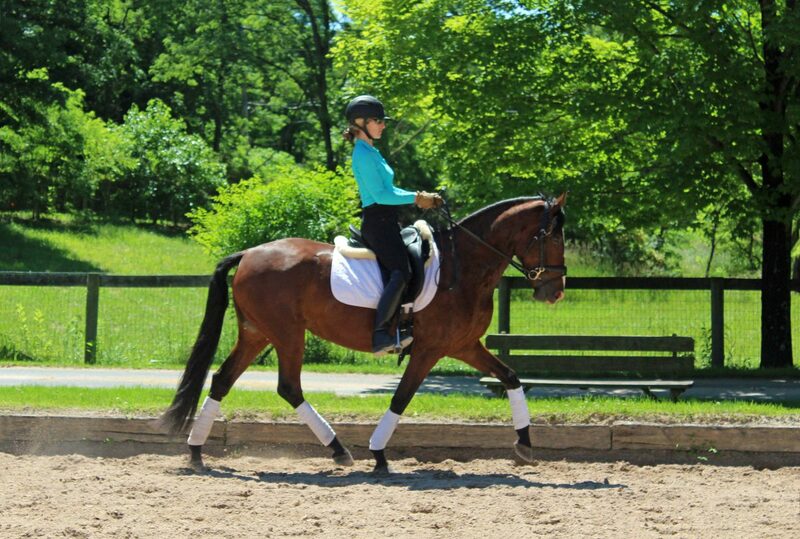 He has the most comfortable gaits and is light in the bridle. Now started in full training. 'Lana' is a 16.3hh 3 year old purebred mare, by Excelso out of a PRE mare imported from Spain. This is a big powerful mare, she has tremendous scope and freedom of shoulder. Lana is full-bodied and shows great potential to be a dramatic mover; even now no one can take their eyes off her when she works. 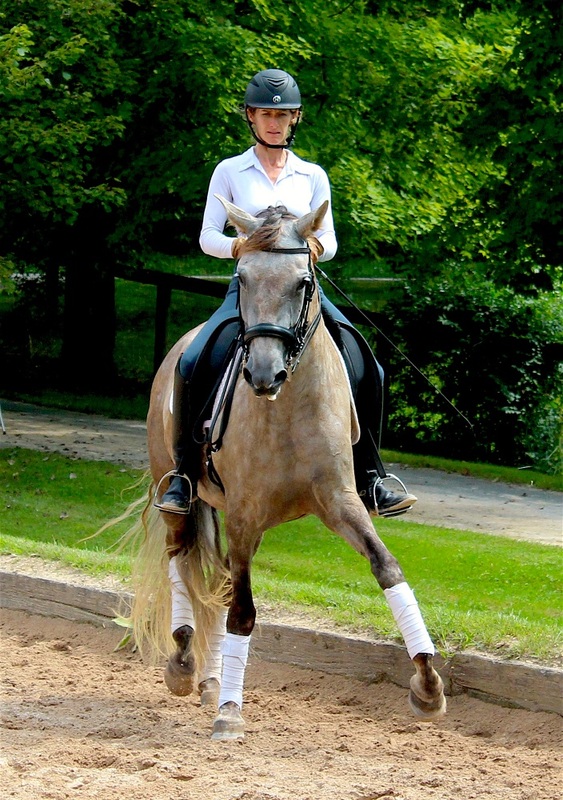 Light in the bridle, doesn't shy, comfortable gaits. 3 year old 16.1hh Infanta is the first filly after four full brothers from the successful cross of Excelso and the Hanoverian mare Denali. Not quite as big as her brothers but a powerful mover with good balance, Infanta has begun her training, and will stay with us for the following year. Leoncio is a 5 year old 16.2hh Andalusian/Hanoverian gelding. He is the kind of horse all instructors wish their students would buy: honest, safe, with talent. "Simba" has a great disposition, consistent work ethic, no vices, no shying, easy to put on the bit, flexible in lateral work with an impressive lengthening. He has started flying changes. At his first show he handled himself like a professional, scoring a 69% at 2nd level, with an 8 on gaits, and several 8s and 9s throughout the test. Simba tolerates mistakes; he doesn't get frustrated with repetition. An ideal horse to train and learn on. Absolutely sound and healthy. "Maya" is a 3 year old purebred Andalusian mare, by Excelso out of a PRE mare whose bloodlines trace back to Leviton, the legendary sire of Spanish team horses including Evento. This is an exceptional mare with a great mind, workmanlike and forward without any silliness. Maya is very well balanced with tremendous athletic potential. Starting lateral work and lengthenings, comfortable gaits, this mare has unlimited potential. Currently 15.2h+, should mature 16h.